Performing routine home maintenance can often be a time-consuming chore, especially when you aren't familiar with particular tasks. Save some time and hassle by calling in a professional handyman that can assist with the repairs that are just out of your reach. Sears Handyman Services is the name to remember when you need an experienced professional to tackle those challenging home repairs and improvements. Whether you have a plumbing issue or want to install a deck in your backyard, our handymen will get the job done while providing superior service. We offer a variety of home improvement services and repairs designed with you in mind. 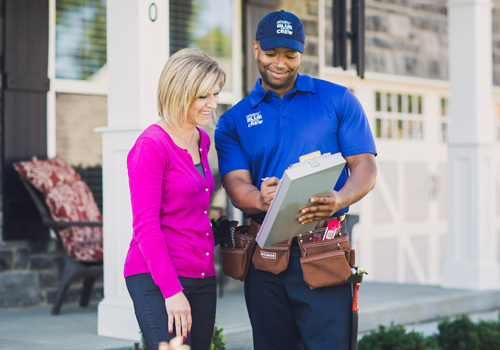 Sears Handyman Services technicians have a diverse skill set sure to complement your needs. Give us a call at (973) 586-5181. Not every lighting issue in your home requires a costly electrician. For minor tasks, such as the installation and repair of lighting fixtures, ceiling fans, and recessed lighting, Sears Handyman Services is qualified to get the job done. Contact us today for a full list of our electrical and lighting services. The elements and general wear and tear can cause major havoc on your home, leaving it in less-than-desirable condition. Our professional handymen can take on these types of repairs. From screen door repair to patio door installation, no job is too small, or too tedious. Call and speak to one of our skilled technicians to determine what works best for you. Through the years, the walls of your home can become marred with various dings, scratches and holes, leaving unattractive scars in your hallways and living space. No need to look the other way. Our professional technicians are experts when it comes to patching, hanging, and repairing drywall. Sears Handyman Services will repair the holes and patch the scratches, all within your time and budget. Vital to the atmosphere of all those summer barbeques and pool parties, decks can suffer as much as any other part of your home. Give it the attention it deserves, whether it's a new stain, or repairing wood rot, our handymen can provide numerous deck solutions that serve your needs. Call us today for a full list of services. The fence around your home serves many purposes, so make sure it's up to scratch by calling Sears Handyman Services. From repairing your existing fence, or installing a new chain link, privacy, or picket fence, we have the professional and courteous staff dedicated to providing outstanding service. Painting can be one of the most laborious home improvement chores, but it is one of the easiest ways to beautify your home. Save yourself the trouble of finding the perfect ladder or figuring out how to reach those cathedral ceilings - give our professionals a call. We can remove unsightly wallpaper, paint your bedroom, or breathe new life into your home's exterior. Contact us today.